I am of both Puerto Rican and Italian decent but grew up on the Italian side of the family. Unfortunately, I don’t have Pureto Rican family recipes to draw from, I do research to develop my own recipes (and maybe learn a bit of my own culture). Using ingredients found in Puerto Rico is a challenge but living in a multicultural city of Toronto (Canada) many can be found in ethnic markets. 3. – when they begin to turn a bit translucent, add the Recaito, mix well. 4. After a few minutes, add some butter. 6. When the stock comes to a boil add the collards and cover the pot. 7. 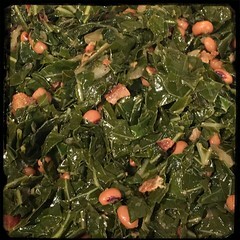 After allowing the collards to cook for about 5-10 minutes, add the beans. Mix well, cover and cook for an additional 10 minutes or so. 8. As the collards and beans simmer, add some freshly squeezed lime juice. 7. Finally, salt and pepper to taste and let cook for a final 5-10 minutes.